PENSACOLA – Support is pouring in for a Christian ministry’s new Genesis-based movie that is being described as an “incredibly unique,” “breathtaking” project. 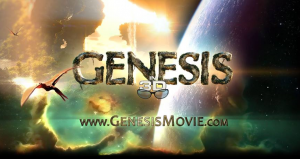 “Genesis 3D” is a feature-length documentary film being produced by Creation Today—a Florida-based Christian ministry. Using stereoscopic 3D animation, the movie will portray the universe’s beginning, as recorded in the biblical book of Genesis. “[This project] will bring Genesis to life in a full, stereoscopic, 3D, feature-length film,” says the movie’s director and producer, Ralph Strean, in a recently released promotional video. Eric Hovind, president of Creation Today and executive producer of Genesis 3D, says people are often more receptive to the Gospel if they understand why Genesis is true. Hovind says the film will help people understand the reliability of the Genesis creation account. On September 19th, Creation Today launched a fundraising effort for Genesis 3D on Indiegogo. As of late Sunday, approximately $120,000 had been donated toward the project’s $150,000 initial goal. Though Genesis 3D is still in the fundraising stage, multiple Christian organizations have endorsed the project, including Answers in Genesis, Institute for Creation Research, and Living Waters. In addition, Christian leaders who have viewed sneak-peeks of the film state that it is remarkable. Ken Ham compared the movie to “a time machine” that shows the Creation account firsthand. Alex Kendrick—director of Facing the Giants, Fireproof, and Courageous—said that the movie “will show Biblical truth in an excellent way.” And Ray Comfort noted that he was “blown away” by Genesis 3D. However, Hovind believes Genesis 3D will be an important voice for the Christian Church, and said non-believers will “need to reconsider their position” upon viewing the film.